Constitution and Flag Day is a public holiday in Turkmenistan celebrated on May 18. It was officially established in 2017 by the Assembly (Mejilis) of Turkmenistan. Originally, Flag Day in Turkmenistan was observed on February 19, and May 18 was celebrated as Revival, Unity and Magtymguly Poetry Day. The latter one commemorated the adoption of the Constitution of Turkmenistan, among other things. However, in 2017 the Turkmen parliament decided to merge Flag Day with Constitution Day and observe the new holiday on May 18. Magtymguly Poetry Day was moved to June 27 to coincide with the Day of Culture and Art Workers. The Constitution of Turkmenistan was adopted on May 18, 1992. It is the supreme law of Turkmenistan that establishes the legal basis for the independent and neutral Turkmen state. The 1992 constitution was amended in 1995, 1999, 2003, 2006, 2008 and 2016. The only provision that can’t be amended is the provision on the country’s form and system of government (presidential republic). The national flag of Turkmenistan was adopted on February 19, 1992. It is a green field with a vertical red stripe hear the hoist side, a white crescent symbolizing Islam, and five white stars representing the country’s five regions. 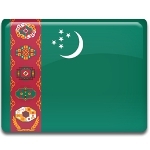 The red stripe contains five guls (medallion-like design elements widely used in the famous Turkmen carpets) and two crossed olive branches that symbolize Turkmenistan’s neutrality. The branches were added to the flag in 1997. Constitution and Flag Day is a national holiday marked with various solemn ceremonies and celebrations. One of its main highlights is a flag hoisting ceremony in the capital city of Ashgabat.